Last week was a busy week here in the Science Wows household, as I am sure it was in many homes across Ireland. We had the back to school for the older two children and the “starting school” for our youngest. It went really well for him, he practically ran in the door without a backwards glance, but let’s just say his parents needed a lot of extra TLC! In fact it was such a busy week that other little milestones were completely forgotten. One was Science Wow’s 3rd Birthday! I can’t believe it has been three years already. I have learned so much in those three years and still have much to learn! Each year as I renew my work Insurance and order another set of children’s lab coats I like to reflect on how the year has gone and plan what I would like to achieve for the year ahead. I have many aspirations and ideas for the next year for Science Wows… and I am always open to new ideas and suggestions! It would seem that this three year anniversary was not the only milestone I over looked this week; I just realised that I posted my 200th blog post last Monday. A small milestone but a significant one non the less. The blog is not three years old yet but it is certainly a project that I hold dear. It has provided me with a platform to develop, explore and express my love of science communication in the written and visual form. The blog too has some highlights for me, this year in particular, so, while I am in a reflective and sentimental mood, I thought I would share a few. …in February I finally took the plunge and merged my blog and website to a brand new site on word press. It was an exciting and creative project but certainly came with lots of glitches and problems. Some of which I am still ironing out. It has taken me a while to get used to this but finally I can say that I am glad I made the move and love how much I have learned and all I still have to learn. … I have stopped some regular slots on the blog (Such as the weekly Mystery Creature post) and started some new ones. I have to say, one that I particularly love is the Simple Slice of Science series. I have had great fun creating the graphic side of Dr. Simple and really love the questions from the young and the “not so young” that have come pouring in. The response to the series has been uplifting and I plan to keep writing and developing the series for a long time to come. All in all I think it has been a great year for Dr. How and my brain is churning in overdrive at the moment planning lots of new projects, ideas, experiments and milestones for the next year ahead. 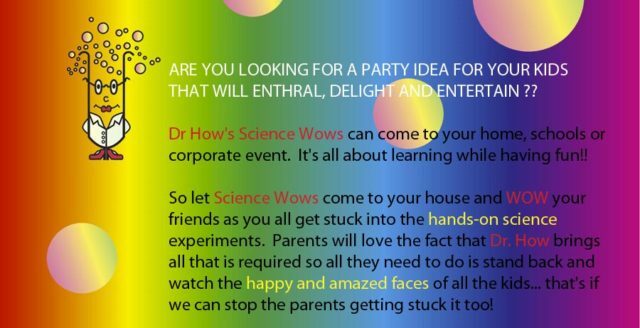 Thank you all for your support in so many ways, from reading these blog posts, to sharing your comments, ideas and feedback and of course, for inviting Dr. How to feature at your party, school or event. For those of you who only know me through the blog, I leave you with a little insight into what else Dr. How’s Science Wows is all about! Happy bloggy birthday and what a great year you’ve had!! Happy Birthday Dr. How! Congratulations on a great three years, and on all that you’ve achieved. And congratulations on 200 blog posts too – lots of lovely reasons to celebrate! Big congratulations Dr. Hows. A huge milestone. And lovely to see all you’ve achieved. Will look forward to what the next year will bring for you. Happy blog birthday! Look forward to more from Dr. How!